Founded in Wake Forest, N.C. in 1834, Wake Forest University is a coeducational collegiate university that has graduated more than 65,000 alumni, including 15,000 from the School of Business. Since 1956, its main campus has been located in beautiful Winston-Salem, which anchors the commercially booming Piedmont Triad region of North Carolina. Additionally, the University has an urban campus amid the influential businesses of uptown Charlotte, serving as the hub for our Charlotte-based MBA programs for working professionals. 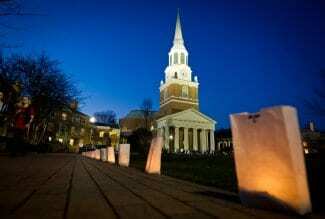 At Wake Forest, the ideal of ethical community engagement is part of a rich campus life. We foster productive collaboration with local, national and global communities in the business, social and charitable realms. Not only does community engagement carry forth Wake Forest’s commitment to public service, embodied in the motto Pro Humanitate (“For Humanity”), it also strengthens the University’s bonds with entrepreneurial communities, seeding new opportunities for the future. On the following pages, you can explore options for community engagement, whether by participating in student clubs and competitions, participating in our outreach initiative in Nicaragua, attending one of our numerous high-profile speaker series events, or participating in the many activities within our Academic Centers. All of these organizations are committed to community exchange and enrichment, uniting the University, the local public and global leaders in common goals.